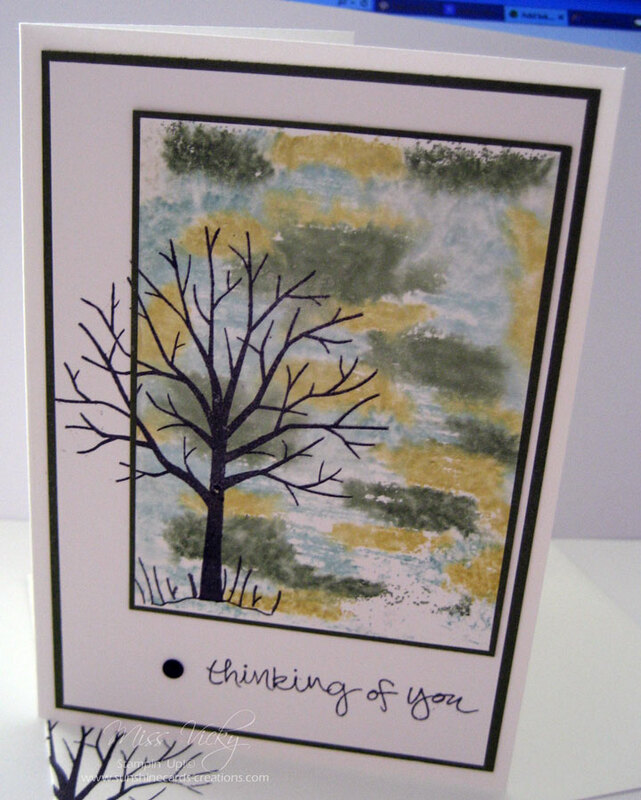 I am sharing a card I created some time ago by using one of our Technique Treats – Vellum. I will be the first to admit I love playing with Vellum, but don’t use it as much as I should. It always looks lovely on cards & so easy to use. I’ve randomly stamped my images direct onto a piece of Whisper White & coloured with my Blender Pen. I Dry Embossed a piece of Pool Party, adhered to a piece of Watermelon Wonder, wrapped a piece of Baker’s Twine around it before adhering to the Card Front. The greeting has been done by using my Stampin’ Write Markers – Mint Macaron, Watermelon Wonder & Memento Tuxedo Black. If you don’t have Markers, you could easily mask off each word & stamp. To create more cards using Vellum, click onto our Technique Page. Don’t forget our next lot of Treats will be released tomorrow. For today’s card I’ve used the “Best Birds Bundle” again! I just can’t seem to get enough of this gorgeous Bundle. There are so many gorgeous Bundles & Dies in Stampin’ Up!’s new Catalogue that I just can’t seem to decide which to purchase. It is a case of wanting it all NOW!!!!! I started off taking my inspiration from P52 of the Catalogue but then started to go along with the Sketch from last month. If you haven’t tried using this simple sketch to create any cards, be sure to give it a go. I am having heaps of fun using the sketch AND it has helped me get back into creating once again. When I first saw this Stamp Set, it reminded of Cherry Blossoms for some reason . After using it a number of times I am now seeing small Frangipanis too. Is anyone else seeing this? To grab your Free Tutorial, please click on the link above the photo. It also includes all the supplies & measurements. Thank you once again for being so supportive with my creations. It is always a delight to receive an email saying how much you enjoy my cards & tutorials. Thank you again! I created today’s card a couple of weeks ago & didn’t realise it hadn’t been posted. I’ve used the lovely new “Best Birds Bundle” for my card, along with Markers which don’t get used as much as I would like. This set includes the gorgeous Stamp Set along with the “Birds & Blooms” Dies. Thought I would just let you know that my “Items for Sale“ Page has been updated. Items include Stamp Sets, Punches, Inks, Refills, Markers, Card, Embossing Folders, Dies & Framelits. I still have Ribbons, Buttons & Assessories to do & they will be posted once they’ve been listed. I thought I would share with you a sneak peak at one of the lovely new sets you are able to earn free from Sale-a-Bration 5 January – 21 March 2016 when you spend $AUD90.00 (excluding P&H). My card started out as a case, but sort of took its own course which is fine with me. You can find this happening from time to time which is a good thing. I’ve made about 6 of these as they will be a start to my Birthday Cards for the next couple of months. I always start the year off with right intentions & then sort of get waylaid. It is my goal to be on top of things & ready for the new year. Don’t forget to click on the link above the photo to download your tutorial to create your own card. Be sure to check back in over the next couple of days for more sneak peaks. 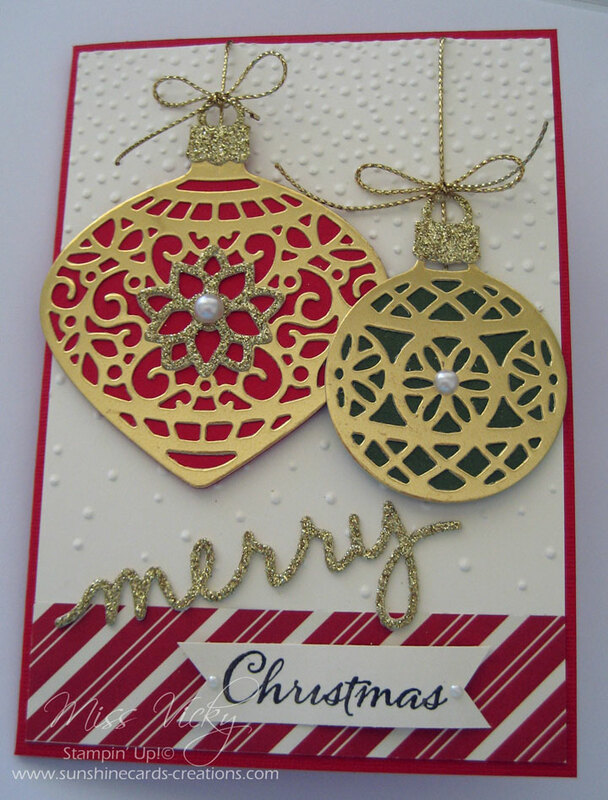 We played with the Delicate Ornament Dies & Embellished Ornaments Stamp Set Bundle last Sunday in our Technique Class. The ladies absolutely loved the cards. I am in 2 minds about these cards that I am showing you today. As I created a silver & gold card – couldn’t decide which I liked better, I let them choose the colour they preferred. The cards were basically cased from the Holiday Catalogue, Page 14 but with my own touches added to them. In fact, most of our products used to create our cards are from the Catalogue. Be sure to pop back in a couple of days & I’ll show you our 2nd card from the same class. 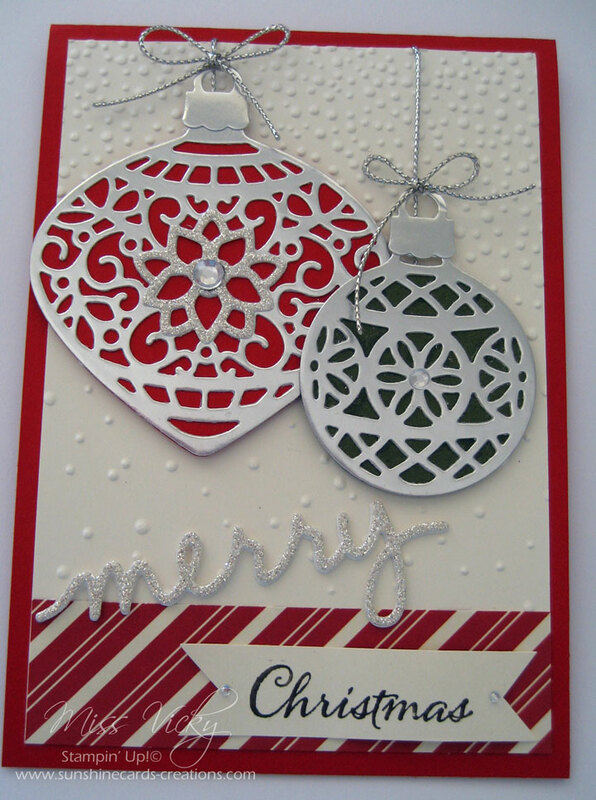 My card today was one we created in our Technique Class some weeks ago – Block Stamping! The class loved it! I saw a similar card on Pinterest some time ago, but of course when I went to link back, couldn’t find it, but thank you so much for your inspiration. I did change mine a little, including the layout. I was asked at a Market I did a couple of weeks ago if I could create some Baby Gift Cards in Lemon, Pink, Blue & Mint. I love creating this size card. They always look so very cute! These are some of the samples I emailed Bernadette.